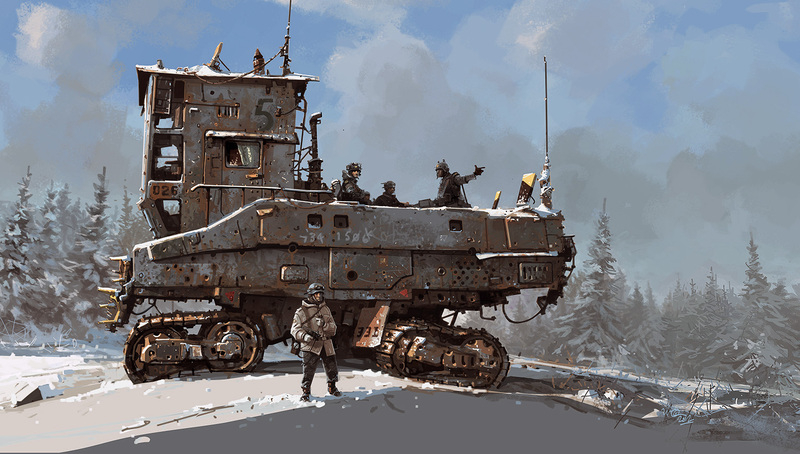 Summary in English: A Swedish podcast about what is steam- and dieselpunk. My debut in podcasting. Take a pinch of dieselpunk, a pinch of steampunk, a pinch of Carolus Rex (link >>>), and a pinch of tarpunk — and voilà. Strange phenomena in the sky? People have reported such matters for a long time, even though the “flying saucer” fad only dates back to the 1940s. In the late 19th century people instead spoke of encounters with human-piloted airships with amazing capabilities, and in earlier times chroniclers mentioned observations of dragons or scary omens among the clouds. Every now and then old art unbiddingly kick-starts my creativity. 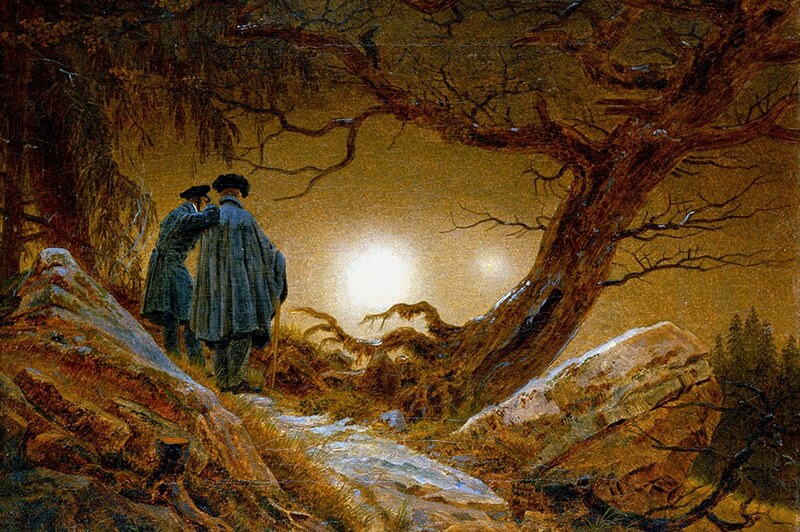 When I recently saw this painting by Caspar David Friederich, a Romantic artist active in the first decades of the 19th century, I read it as a depiction of a UFO encounter by two Germans during the Napoleonic Wars. X-Files in a historical setting, so to speak. Such an interpretation could serve as the starting-point for an adventure in Götterdämmerung (a Swedish 18th-century horror RPG); as a clue indicating that something nefarious travels through time in Skuggornas Mästare (a Swedish modern-day conspiracy-themed RPG); or as the inspiration for an “X-File-ish” campaign that mixes GURPS Age of Napoleon with GURPS Atomic Horror. It is also possible to realign the steampunk Space 1889 to a tarpunk Space 1809 by letting UFOs take a group of Regency-era adventurers to Mars (that world remains the same, just remove Victorian colonialism). Martian muskets and steam engines use technologies that are familiar to Westerners of that era, and serious speculations about alien populated worlds were introduced in European academia already in the 16th century, by for example Giordano Bruno. French inventor Nicolas-Joseph Cugnot built the first functioning steam wagons around 1770 (link >>> ). In 2010, a group of students at the Arts et Métiers ParisTech engineering university built a replica of one of Cugnot’s designs and put it to work with a reasonable success. A horseless wagon must have been an impressive device in the late 18th century, but I guess that the poor quality of roads in those days prevented the widespread use of such a heavy vehicle. However, in a tarpunk or early-steampunk alternate history, improved versions of this wagon could possible become useful provided that the inventors developed broad low-pressure wheels for contemporary gravel roads. This masterpiece would be appropriate for an 18th-century “Bond-villain” with plenty of nasty poisons and objects hidden inside. This programmable mechanical marvel would fit perfectly into Vidonia, the main geographical region of my renaissance fantasy role-playing game Gondica and my novel Spiran och staven. The Mechanurgist magician-artificers in that culture construct devices like this, though often even more fantastic. I also think that it could be appropriate technology in the Swedish 18th-century horror RPG Götterdämmerung. 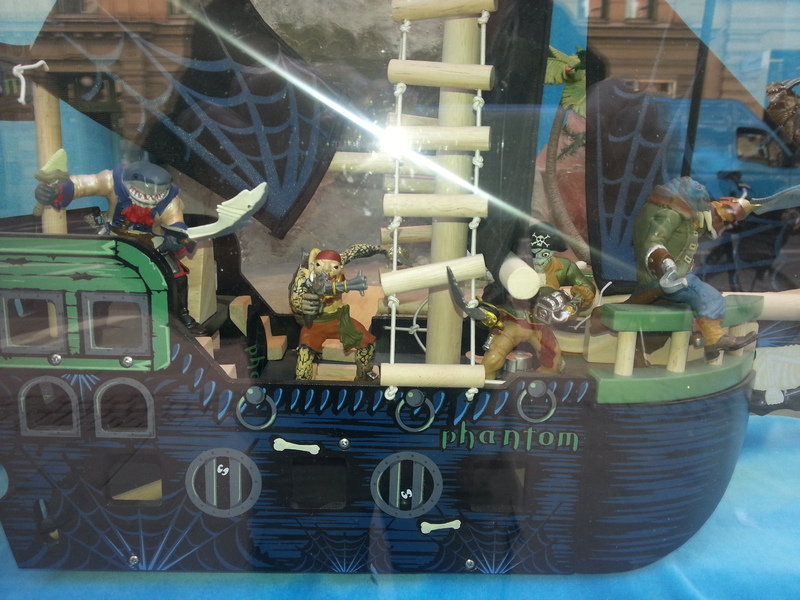 A toystore near my office has a multi-ship pirate diorama in its display window. One tarpunk sloop has a fearsome mutant crew. You get a larger version of the photo when you click on it.